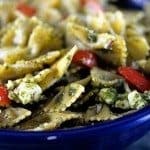 Classic Pesto Recipe – Made of fresh basil, garlic, nuts, olive oil, and cheese, this pesto recipe comes together in minutes and adds so much flavor to so many dishes! My basil has been so abundant lately. I’ve used it so much that I always think I’m going to use it all and then, by the miracle that is a basil plant, it grows more abundantly. Hey, I’m certainly not complaining. I’m absolutely grateful! We’ve used it in just about everything possible this year from our caprese grilled chicken to pasta. But I do have to tell you, I’ve had more than my fair share of caprese salad this summer. Oh my goodness, have I ever! But, I’m also making a dent in replacing the pesto I saved from last summer that I used throughout the winter. My goal is to put back twice as much as I did last year, although I have no measurements from what I did last year. So, I’ll have to guesstimate and then probably do a bit more. This classic pesto recipe comes together in a snap and adds so much flavor to so many dishes from fish, seafood, chicken, and veggies! I just can’t get enough. To make this classic pesto recipe, I started with fresh basil that I’d just picked and washed from the garden. 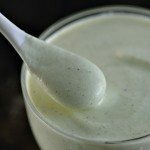 I add the basil, garlic, nuts and salt to either my food processor or my high speed blender – either works fine and I use whichever one is on the counter at the moment. 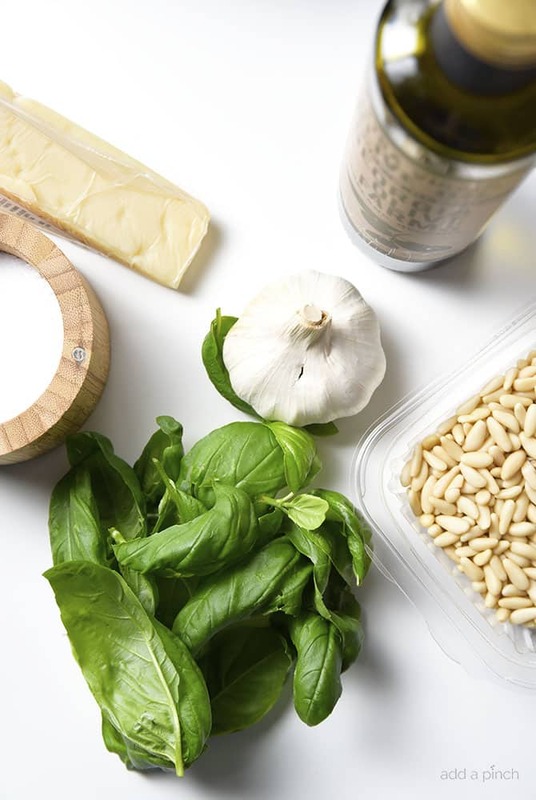 Now, I will say that classic pesto uses pine nuts in the recipe. However, if you have a hard time finding pine nuts, you can easily substitute with another nut such as walnuts or, I also like to use shelled sunflower seeds. Truth be known, sunflower seeds actually are one of my favorites and I switch back and forth using it all the time. They are also usually less expensive than pine nuts which makes it all the better. Then, I slowly begin to pour in the olive oil through the top chute of my blender or food processor while the machine is turned on about low to medium speed. I normally stop to scrape down the sides of the bowl or blender container a few times while I’m making my pesto to make sure there aren’t any unprocessed lumps of garlic or anything else in my finished pesto. Once my pesto has reached a consistency throughout, you can immediately pour it into ice cube trays or mini muffin tins and freeze for later use or refrigerate to use soon. If I am going to use immediately, I go ahead and add my Parmesan cheese. If I’m freezing or refrigerating, I like to add the cheese right before I plan to serve it. Here’s my Classic Pesto Recipe. I hope you make it soon! Classic Pesto Recipe - Made of fresh basil, garlic, nuts, olive oil, and cheese, this pesto recipe comes together in minutes and adds so much flavor to so many dishes! 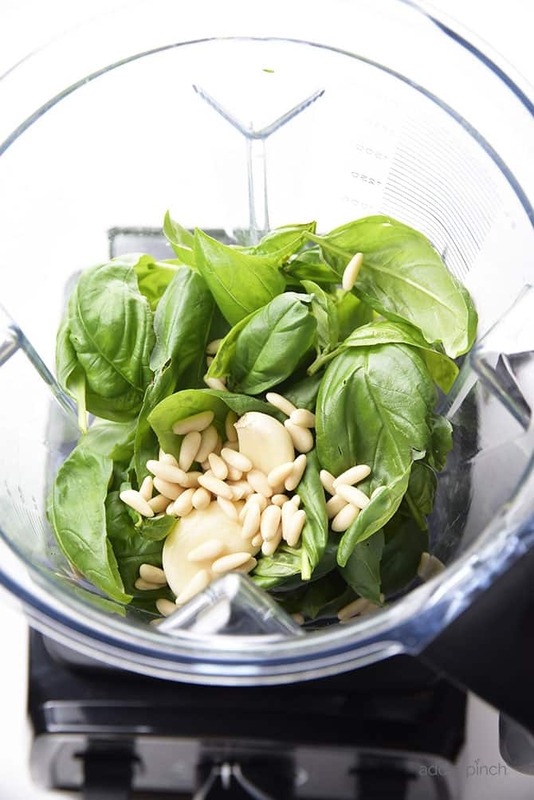 Add basil, garlic, pine nuts, parmesan cheese, salt to the bowl of a food processor or high power blender. Turn food processor on and begin slowly pouring olive oil through the chute of the machine, stopping to scrape down the sides of the bowl. Store in the refrigerator for a few days or freeze in ice cube trays and then store in zip top bags for a few months. 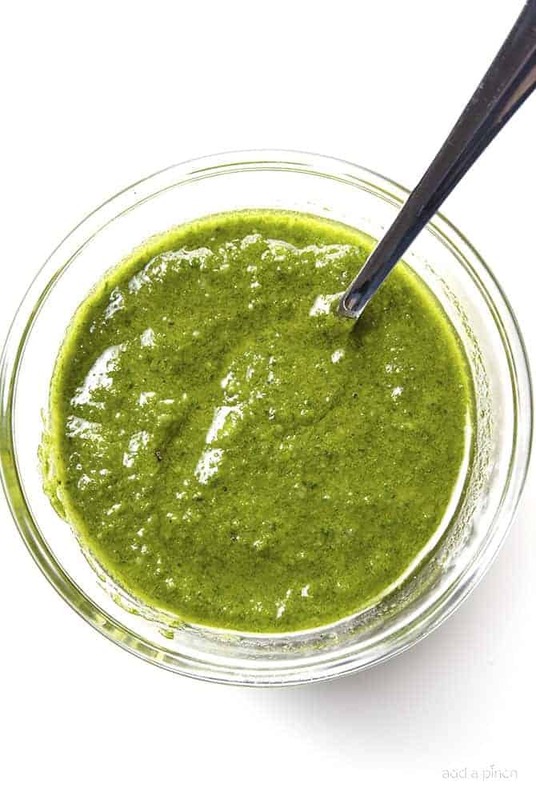 Store pesto in an airtight container in the refrigerator for up to 1 week. Pour pesto to an ice tray and freeze for 30 minutes. 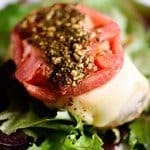 Transfer frozen pesto cubes to a zip top freezer bag or other airtight, freezer-safe container and store for up to a year. Thanks for this recipe. I love pesto and my basil patch is full now! I am thinking I will put it on grilled chicken etc. I would love a chance to win a hammock. I used to use one years ago at camp with my late hubby. I had fallen out of mine a few times, the one we had is long gone. I would use it in my yard and it looks comfy to read in! Thanks. 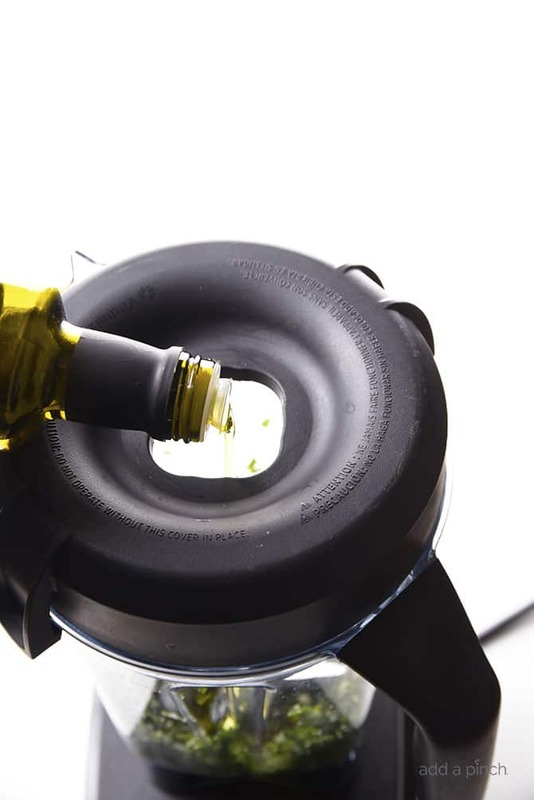 Do you dump the olive oil in with all the other ingredients, or add it in a stream while the processor is running? Thanks Robyn for the nice recipe. I think a pesto pasta is so good. 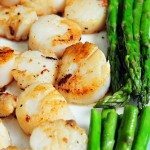 Pinning your recipe! Your story was so funny about your spill in the new hammock although I’m sure at the time it wasn’t. My husband has always wanted to hang one in our backyard. Fresh pesto is the best! Love this recipe! This is my favorite way to make Pesto, and so easy! BTW my Food Processor doesn’t have a chute so I have to add the oil in with everything else. Its hard to know if I add too much or too little, but it works if you don’t have another option. Thanks for the suggestion on using Sunflower Seeds, I used Pecans last night and that was great too! Hi, I fell in love with this recipe of yours. 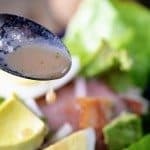 I have already tried it once and I was pleased with the outcome because it did not only turn out to be delicious but also healthy for my whole family. I was amazed because my kids don’t like eating vegetables but this recipe of yours made them eat plenty of vegetables. Sohapp! One proud mother here. Thank you for sharing! Wow! That’s wonderful, Stephanie! I’m so glad your whole family enjoys this! What variety of basil do you use? 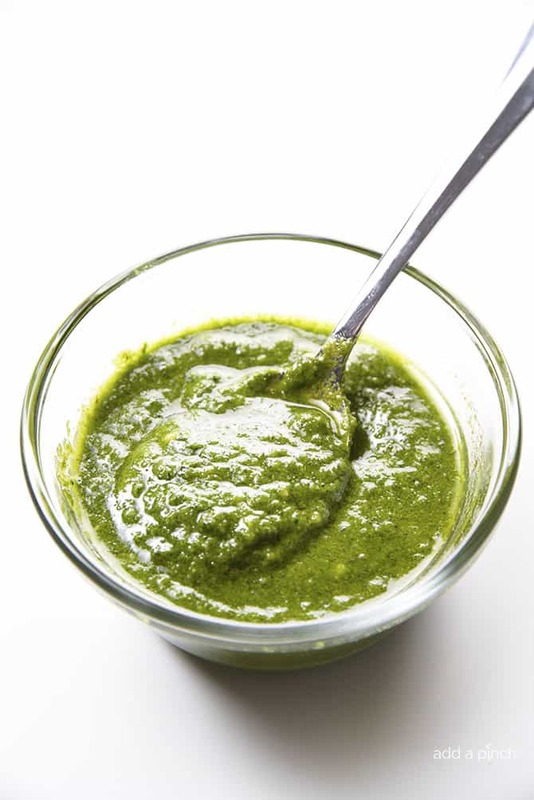 We have Lime and Cinnamon, would that change the flavor of the Pesto? A nice simple pesto is so delicious! I have to harvest some basil from my garden and make this ASAP! Thanks for the tip on freezing the pesto. I’ve wondered if you could freeze a batch for later. 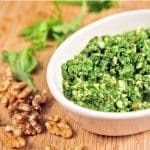 Toast your pine nuts before – adds an awesome depth to the pesto! I have made this several times and I love it. I often pump up the amount of garlic and it gives it a nice punch. I can eat a spoonful of it as a snack it’s so good!